The technical department of Outdoor Solutions has designed, made and installed the first national sunshade covering an area of 81 m². The Adonis model arose from a customised project in the Hotel Paraíso de Alcudía, Palma de Mallorca. On this occasion, a fully automated sunshade was built with an electronic motor for opening and closing it by radio and fully equipped with lighting, heating and an audio kit. Adonis is anchored to the ground with a concrete base and a fully customisable structure according to the sunshade’s total size. This sunshade can cover areas of 9 x 9 m and larger sizes can also be created for special projects. Equipped with built-in LED technology, Adonis transmits a different appearance to other sunshades. The fact that its rods are illuminated gives it added value while attracting those from outside and making those next to the sunshade comfortable thanks to its quality and its agreeable lighting (the strength of which can be adjusted easily with a remote control). Its accessories include LED lighting on the rods for creating various ambients as well as adding a built-in audio kit and HVAC with infra-red heaters. 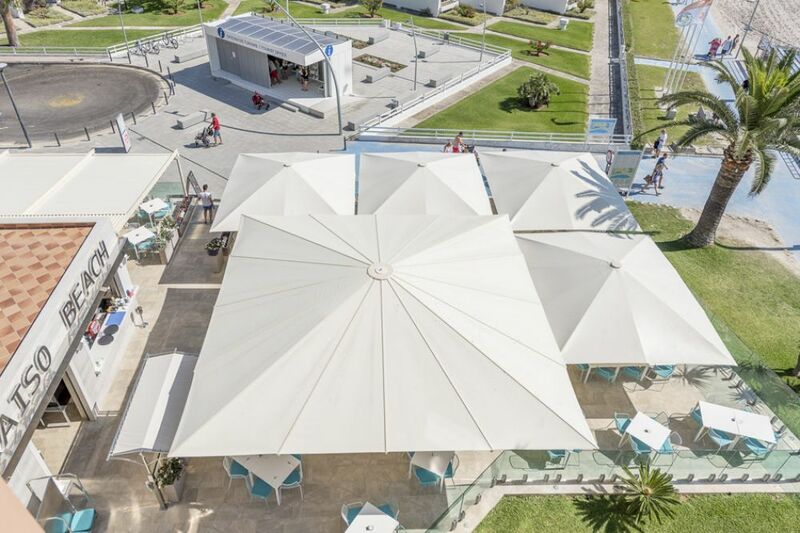 Adonis is the ideal sunshade for covering large outdoor areas and for providing a covered area with greater performance. In the last year, the IASO technical department has installed two Adonis sunshades, in Ordino, Principality of Andorra, measuring 8 x 8 m and the last in Palma de Mallorca, measuring 9 x 9 m. Without doubt these projects mean progress for IASO, whose objective is always to seek innovation in the market.